The MBUS Front Sight is adjustable for elevation and fits most 1913 Picatinny-rails. Made in U.S.A. The dual aperture MBUS Rear Sight is adjustable for windage and fits most 1913 Picatinny rails. Made in U.S.A.
Definitely order from TT again. Thanks. Tom's Tactical offered the front and rear sight as a set at the lowest online price I found. Fast shipping and would recommend them highly. 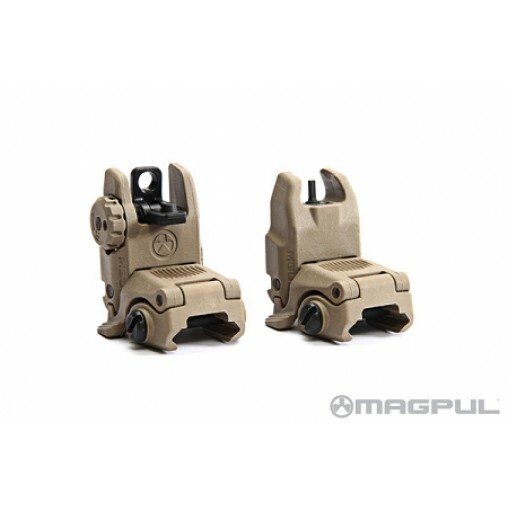 Magpul is great quality of course. Tom's has the best price I've found on the sights. Shipping was quick. When I need more, I will buy from Tom's. Great product (mbus-magpul) Great service and the best price around (Tom Tactical), it don't get no better than that.TT YOU ROC. Nuff said.Highly recommend you!!! Excellent deals, fast shipping, and the products are in stock.